The balance, control and endurance needed in downhill skiing require comfortable, well-fitting boots. Footbalance custom insoles customize your boots for superior, all-day comfort while providing proper support for stability, stronger turns and better feedback. Misalignment in the feet and ankles affects overall body alignment and efficiency, negatively affecting stability, edging, control and stamina. It’s difficult to maintain a balanced stance when the feet don’t form a stable platform underfoot.Edge control is harder, and turning less efficient. Without proper support the arches collapse under the force of each turn, wasting power and decreasing sensitivity. Overall transfer of energy and impact is inefficient, tiring the feet, legs and back. Foot numbness from uneven load distribution across the feet is common. 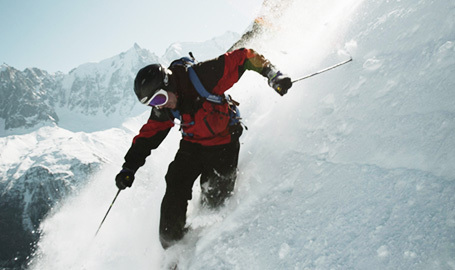 Skiers often try to improve sensitivity and control by sizing their boots uncomfortably tight. When feet are poorly supported this makes things worse by increasing foot collapse and painful pressure spots while further restricting blood circulation. Footbalance insoles support your feet in proper alignment for better stability, control and responsiveness in each turn. When your feet and ankles are properly aligned and supported they work with your boots instead of against them to form a balanced, stable platform. The body works more efficiently, reducing the risk of injuries from stress and overuse. You can direct power properly when edging for easier, more controlled turns. Blood circulation in the feet improves, decreasing fatigue and numbness. Molded to your unique feet, Footbalance insoles customize your ski boots for superior comfort, stability and control so you can ski longer and enjoy each turn.